Be it a hangover that you are suffering from, a breakdown that has led you into a crying fit, the party season where you have stuffed up on a tonne of salt, processed food and alcohol or if you have a naturally chubby face that you would like to thin down, we have tips & tricks that will work effectively in all these scenarios. We suggest splashing your face with cold water every morning as not only will this wake you up instantly but will constrict blood vessels, promote blood circulation, reduce the appearance of dark circles and swelling. Basically bringing blood to the capillaries and encourage flushing of toxins that may have developed overnight especially if you sleep without a pillow or on just one pillow, directing the fluid to your face. A quick tip is to keep your head slightly above the level of your body whilst sleeping to prevent a puffy face in the morning. Processed food, alcohol and salt is known to posses a high quantity of sodium. What sodium does is to enhance a puffy face as to dilute the sodium in the body, it retains excess water. Giving up alcohol, processed and salty food or swapping them with healthy alternatives such as fresh fruit and veggie snacks, healthy juices and malts or black salt will of course diminish the problem of a puffy face completely making you healthy inside out. However to temporarily get rid of a swollen face if you cannot give up these vices is to consume litres of water for the sodium to dilute easily and the body to no longer retain excess water in the face. 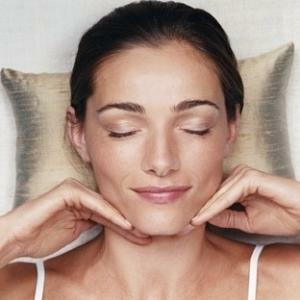 Placing ice packs on the cheeks can also help get rid of puffiness. Your face is made up naturally of hollows and high points which can be artistically enhanced and balanced by good make-up skills to give the illusion of a slender face. Get our your cream and powder bronzers and start shading your face like it’s a blank canvas. The idea is to target the hollows of the cheeks first and shade under there to make them appear sunken and regressed. Make sure to opt for a matte, golden toned contour power or a bronzer with beige-grey undertones to it so that it can mimic the shadows of the face naturally. Shading around the temples, jaw bone, chin and the sides of the nose with a darker shade will also narrow a wide, chubby face. This is often ignored by those who carry out the above method of shading the face. Highlighting the high points of the face is equally important in redefining its symmetry. Bringing out the cheekbones, bridge of the nose, cupids bow on the lips, chin and forehead with a natural looking power/highlighter/illuminator that is slightly lighter than your skin tone will make the face appear more bony and indirectly take the attention away from chubby areas. 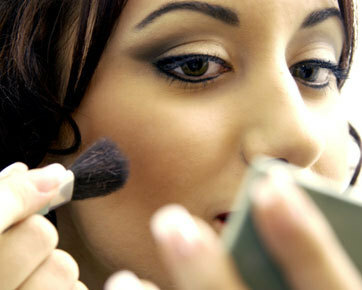 Lightly dusting the collarbone with a dewy highlighter/illuminator will also give an illusion of a slender frame.